Successfully Added Wireless Signal and Camera Lens Detector to your Shopping Cart. Wireless Signal and Camera Lens Detector - the newest in anti-surveillance technology provides a simple and convenient way to protect your privacy and safety. Wireless Signal Detector: The wireless signal detector will either beep or vibrate (depending on mode) whenever it detects a wireless signal. Once detected, just use LED signal strength indicator to follow the signal back to the source. If there are too many signals nearby and the signal strength is constantly at the maximum, just lower the sensitivity through a convenient slide on the side of the device. Camera Lens Detector: The camera lens detector includes 6 ultra bright LED lights to help locate the exact location of any surveillance equipment. When turned on, the lights will reflect off of the lens of any devices and small cameras, allowing you to easily pinpoint their location when peering through the viewing window. With a quick sweep of the room, you'll be able to effortlessly locate even the smallest of cameras. 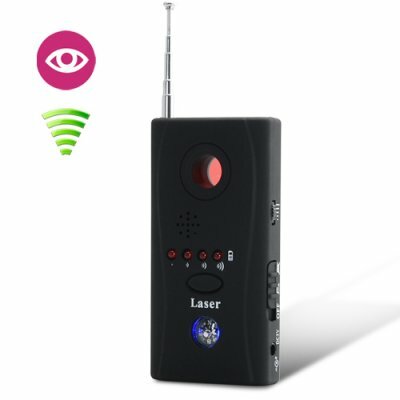 This Wireless Signal and Camera Lens Detector is an industry favorite and is commonly used by the military, casinos, banks, hotels, celebrities, police, private detectives, schools, train stations, and many others. Available in our warehouse now, order today and we'll express ship it out tomorrow! Brought to you by the leader in China Electronics - Chinavasion. How come the detector's signal strength is always at the max, no matter where I am? There may be too many signals nearby (television, radio, cell phone, etc.). Just lower the sensitivity and it will start to pick up only the signals closest to you. I'm looking through through the lens detector, how do I know when I've found something? The reflected light from the lens will create a very bright light to instantly catch your attention. You can't miss it! Will I really need this signal detector? Aside from finding cameras, you can also use the signal detector for things like finding if there are any hidden GPS trackers in your car or if someone is using a cell phone when they shouldn't be.